ROANOKE, Va. -- All four of No. 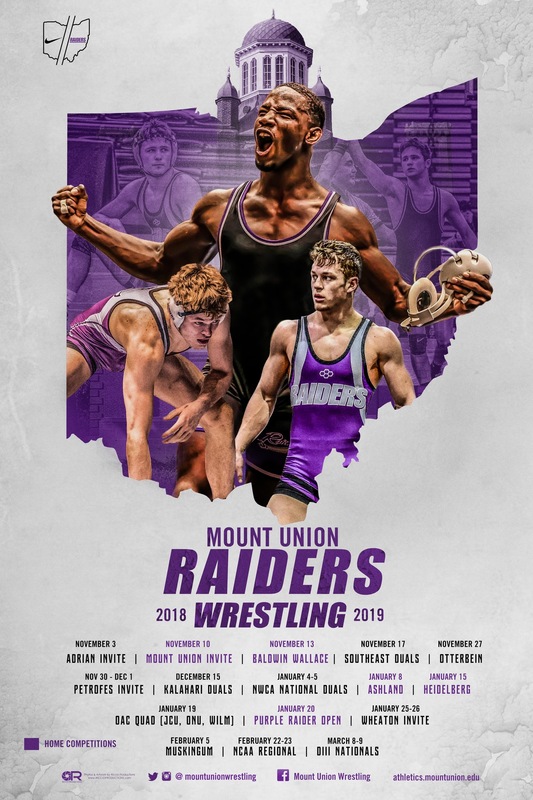 7 ranked Mount Union's wrestlers have received All-American status after day one at the 2019 NCAA Division III Wrestling Championships at the Bergland Center. The Purple Raiders currently sit tied for fifth place with Johnson & Wales (R.I.) with 33.5 points. Augsburg (Minn.) leads with 71.5 points. Jordin James (Bedford), Antwon Pugh (Fairlawn/Copley) and Jairod James (Bedford) have each advanced to the championship semifinals at 133, 157 and 174 pounds while Luke Hernandez (Nashport/Tri-Valley) continues to advance in the consolation bracket at 149 pounds. At 133 pounds, Jordin James posted an 18-1 technical fall in his opening match and won via sudden victory, 13-11, after trailing by as much as 10-5 to keep his championship run alive. Pugh adds a pair of decisions to his season record to remain undefeated at 157 pounds with a mark of 33-0. Defending national champion, Jairod James, went perfect on the day as well in the 174 pounds weight class. Hernandez fell short against No. 7 ranked Alex Wilson of Augsburg in his debut match but answered with a 5-2 decision, followed by a pin over No. 6 ranked Kristian Rumph (Wartburg) at 4:29 to secure his spot in the top eight to become an All-American. With four All-Americans, it is the most that Mount Union wrestling has had at the national tournament since the 1994 and 1995 seasons. Wrestling will resume Saturday with semifinals beginning at 10 a.m. and finals slated to start at 7 p.m.